Located on the second floor, easily accessed from a small set of stairs to the right of the main entrance. Dance Theatre, which seats 190, is a flexible-use space with the option for natural light from large windows at the top of the seating area. 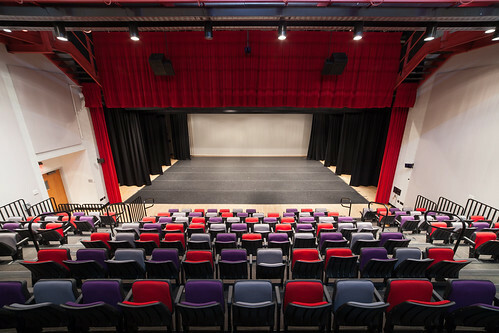 The performance/rehearsal area has a marley covered wood-sprung floor and a retractable bleacher system that converts the venue from a rehearsal studio into a dance performance space with theatrical lighting and proscenium curtains. For technical specifications of the Dance Theatre, click here.